To get the word out about Something Furry Underfoot, I hired two marketeers, as I call them, which are people who market things like books. One marketeer is Jenkins Group, a book marketing company in my home state of Michigan. They got me set up with something called ReviewDirect which reaches something like 18,000 librarians, book stores, colleges and universities. They also issued a press release on September 25 targeted to media and other folks who are at interested in pets. Meanwhile, my other marketeer, Stormi, from Lightning Book Productions, set up a virtual book blog tour for me. That means my book will be talked about on various book blog sites from September 26- October 10 by people who blog about books from their homes in the UK, Ireland, Canada, Nigeria, and the United States. The schedule of events is below. Also, check out my new video about Bumpkin, the domestic duck, by clicking on the Videos page of my web site. Thanks! 26th Rachel @ My Kid Has Paws. Here is Rachel’s great review! 27th Annette @ Books & Tales Here is my author interview! 28th Heather @ Sit Down Saturday. Interview and exerpt from my book! 29th Stormi @ Books, Movies, Reviews, Oh My!. Summary of my book. Ruth @ My Devotional Thoughts. A 5-star review! 30th Debra @ 3 Partners in Shopping, Nana, Mommy & Sissy Too!. Guest post. 1st Lade @ We Blog About Books. 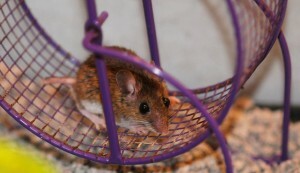 A fun guest post. This site is in Nigeria. Sara @ A Drunken Druid’s View. Another sweet review! From Ireland. 3rd Bethany @ Cascadian Nomads. A wonderful, touching review. Patrick @ http://the-thursday-interview.blogspot.com/. A fun interview with some really interesting questions. This site is in Ireland. 4th Ann @ Pawsitively Pets. 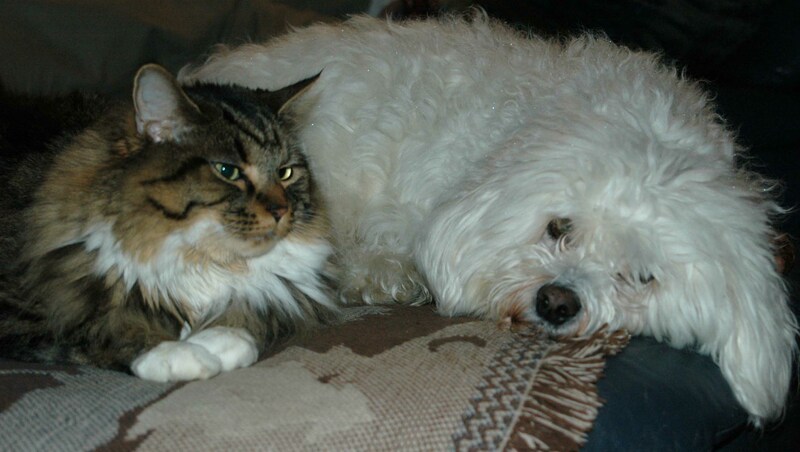 Guest post with photos of some of the pets. 5th Morgen @ Morgen Bailey’s Writing Blog. Another fun author interview. This site is in the UK. 6th Darryl @ Savage Lullabye and 7th Susan @ Green Frog Reviews. These were both supposed to be reviews and both were no-shows. BUT, my new friend, Blondie, from the UK, posted an amazing review on Amazon.com and GoodReads! Thanks, Blondie! 8th Brianna @ Listful Booking. Review. 9th Kathleen @ Jersey Girl Book Reviews. A very nice review, and a plug for my book to animal lovers. Kimberly @ Turning the Pages. A 4 1/2 star review! This blogger blogs from Canada. 10th Valerie @ The Gothic Ballerina. A guest blog posting about Bumpkin, the domestic duck! Overall, the book blog tour was a huge success–bloggers who provided reviews had some awesome comments to help promote the book, and several media contacts were made, including my first radio interview, which will be October 26 at 3 p.m. with Dream4More. (More on that later). Three other media folks are currently reviewing my book, and there were lots of Tweets and ReTweets. 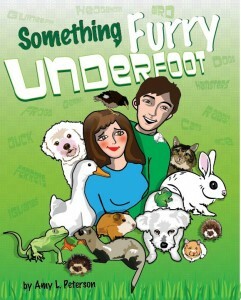 Thanks everyone for helping get the word out about Something Furry Underfoot! It’s been almost a month now since Mark and I drove from Michigan to Pennsylvania to look at the puppy Mark fell for that we named Winston . 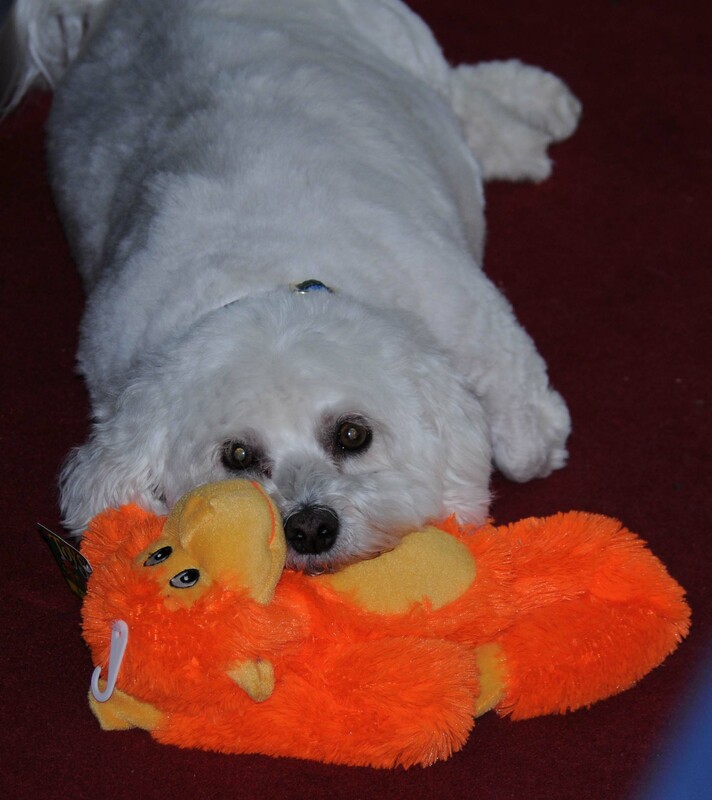 . .
Winston with one of many toys.
. . . and also came home with a pal for Winston that we named Snickers. Puppies can’t tell time. Mark is often up between 3:00 and 4:30 a.m. letting the pups out because at some point in the wee hours of the night, Snickers whines to let us know he or Winston has to go out. I, of course, go back to bed. See, Mark’s a guy, and it’s safer for a guy to be outside in the middle of the night, and I have to work most days. It works out quite well. Unless you’re Mark. Puppies need special food. 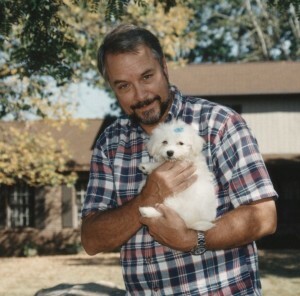 When we first got the pups home, we set off to buy one of the best puppy foods available. At one of the four local pet stores we frequent most weekends, we were greeted by a lady with a coupon for Dr. Gary’s Best Breed puppy food which we later found at http://www.bestbreed.com. It’s all natural food with no preservatives or anything else that’s scary. We took a bag home and the pups liked it. Some puppies need really special food. Snickers has an underbite and once we fed him some of the new puppy food , we realized that it took a while for him to eat a hard kibble. 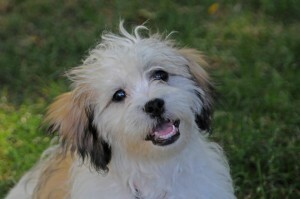 So we now take some of Dr. Gary’s Pure Breed puppy food, add warm water and some Pet Milk and let it soak. Once the food is all soft, we spoon out several spoonfuls, add some cooked hamburger, microwave the mixed mess, let it cool and put it on the floor for the pups. 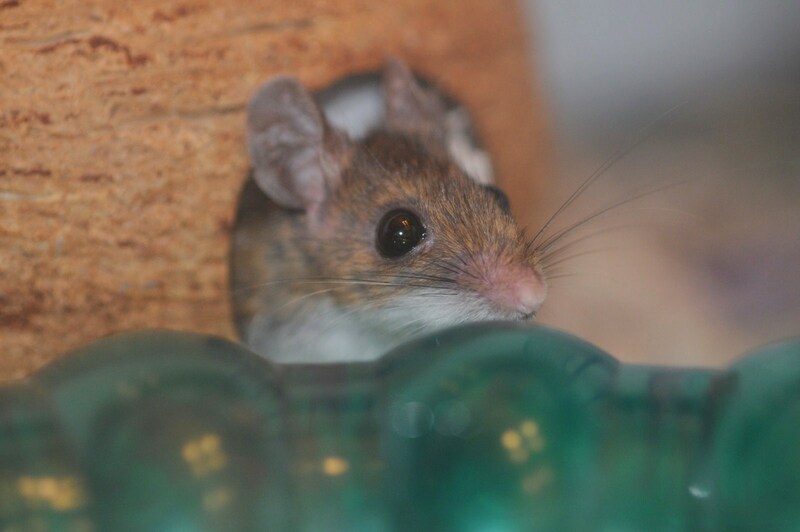 Snickers has no problem chewing this yummy food. Puppies need lots of exercise. 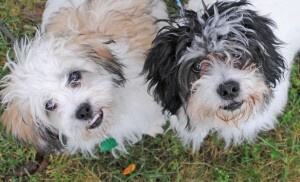 Snickers and Winston will wrestle and play together a lot and we also play with them. But a nice walk outside gives them more exercise, allows us to interact with them and practice our leadership skills, and it gets them used to being on a leash and walking properly. 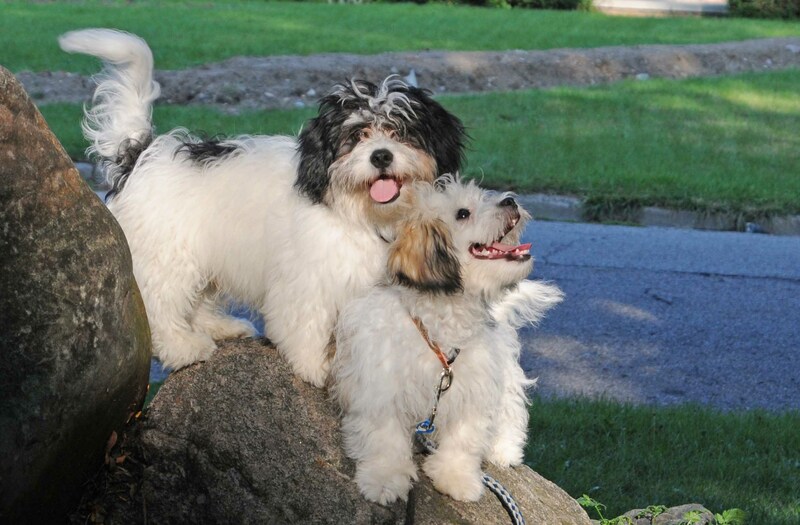 Our pups love these walks because they love to sniff and explore. Two puppies are better than one . . . mostly. The only downside of having two pups is that you can’t always figure out who caused the trouble–who pulled the roll of toilet paper off the roll in the bathroom, who brought the underwear down from the back room into the living room, and who led the effort to chew up the Ono card game. Just look at these faces? Who’s guilty of the latest crime? I can’t tell. Puppies need lots to chew on. So there I was writing at the table, when I felt this strange vibration from the bottom of the table. I looked down and saw Winston gnawing on the table leg. I gave him a stern “No! 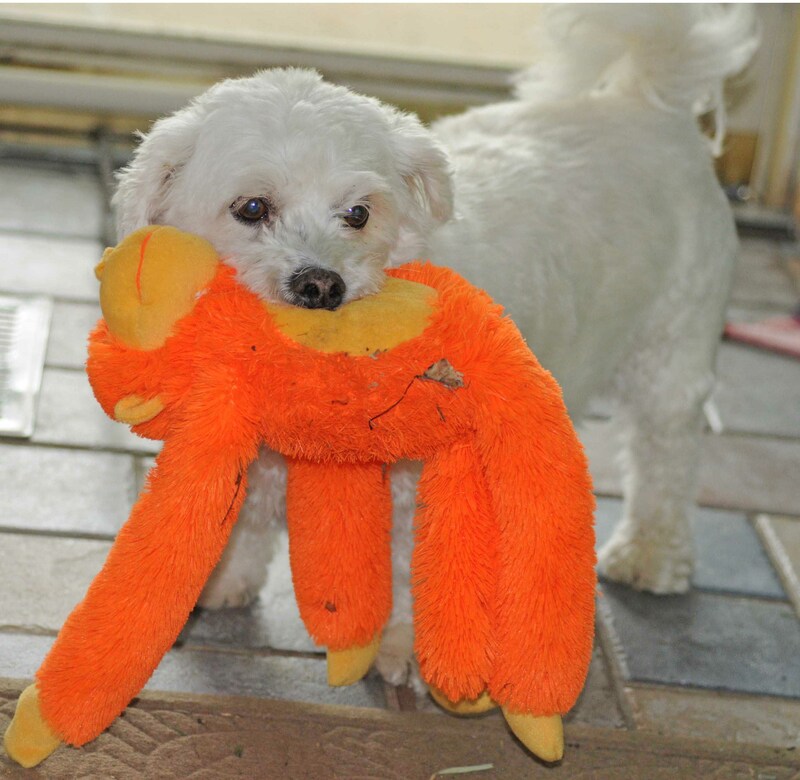 !” got up and found his Kong ball (a rubber gadget with dog treats stuffed inside). Puppies will explore, cautiously. Winston and Snickers came from a farm in Pennsylvania where there were no cars, no people walking by, no skateboards, no kids. We live in a suburban area and every new sound sent the pups scampering back to the front door. Inside, they ran away from the dishwasher, barked at people on TV and, my personal favorite, barked at Stepkid #2 as she Skyped from Germany. Slowly, but surely, though, they are getting used to the noises and their yard. Puppies can be expensive. Our first trip to the vet with Winston and Snickers cost us $519. 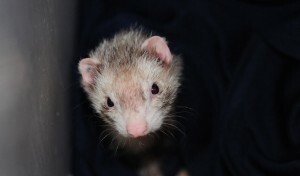 It included two examinations, two rabies shots, one eye dye treatment to make sure the scratch Snickers had on his eye did not affect his cornea, two one-year supplies of heart-worm treatment and two one-year supplies of flea prevention. An hour after the visit, while I was suffering a heart attack due to the money I’d just spent, Winston starting running around rubbing his nose in the carpet and on pillows. I looked him over and discovered his face was all chubby, his lip all leathery and puffed up. We rushed off to the MSU Small Animal Clinic and $129 and a shot of Benedryl later, Winston’s reaction to the rabies shot was under control. 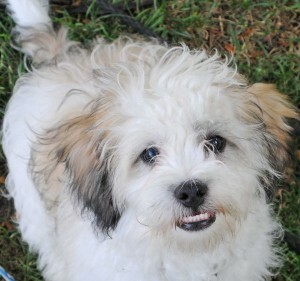 On tap in the next month or so: the need to get the pups neutered and groomed. Having pals is a good way to go. Winston and Snickers are very protective of each other and seldom more than a few feet apart. Yet they’re also great pals for Mark and me. Snickers and Winston on the floor. It’ll take lots of time and patience to train puppies–house training, getting them used to leashes, and riding in the car. Mark works with the pups while I’m at work, and we both work with them in the evening. It’s amazing the time it takes, but it’ll be worth it when they are fully trained. 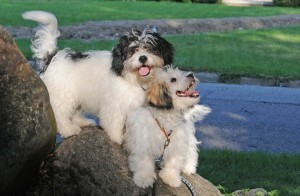 In fact, everything about our pups is worth it if you ask me! Winners of the Name the Puppies Contest! Thank you for all the great name suggestions for our two puppies. The Name the Puppy Contest ended on September 6 and after intense debate, Mark and I selected the two winning names: Snickers and Winston. The winners of the contest are Janet Peterson, my cousin from Alabama, and Virginia Lydic, a.k.a. Stepkid #1 who provided no less than 6 sets of names for our consideration using a fun email address we didn’t know she uses. To make sure everyone realizes how much we appreciate participation in this event, today I emailed all the participants, offering them either an e-copy or signed paperback of my book, Something Furry Underfoot. Two people did not provide their email addresses, so if you entered the Name the Puppies contest and did not hear from me, contact me at amylpeterson@aol.com. In return, I’m hoping readers of Something Furry Underfoot will feel compelled to provide comments on Amazon.com because comments help sell books. Also, some proceeds of my book will be donated to animal rescue organizations. Thanks again to all the participants! If you know Mark or read Something Furry Underfoot, you probably realize that when it comes to pets Mark is rather uncontrollable–he blinks and another new fuzzy shows up in my house. So, it probably won’t come as too much surprise that Mark went exactly three days without a dog in the house before he went online in search of lasa-bijon puppies, which is what Dusty and Little Dipper were. On Sunday morning, he found exactly one breeder with such puppies, and he fell immediately for a four-month-old black and white dog named Lucky. It didn’t matter that the breeder is in Pennsylvania. And it only mattered for 24 hours that the breeder is Mennonite and didn’t answer Mark’s email on Sunday. 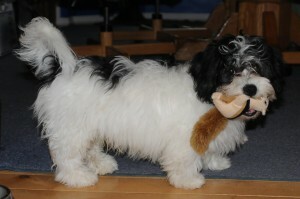 But it was all good on Monday morning when the breeder emailed Mark and said that Lucky was indeed still available. So what is a spouse to do? Leave work at noon on Monday, drive to Pennsylvania, stay over at a Super 8 motel, eat bar food at a place known for giant hamburgers, and finish driving a dozen gnarly twisty, windy roads the next morning. We arrived at 9 a.m. on Tuesday at this beautiful farm with free-range chickens and well-pampered pups, including Lucky. 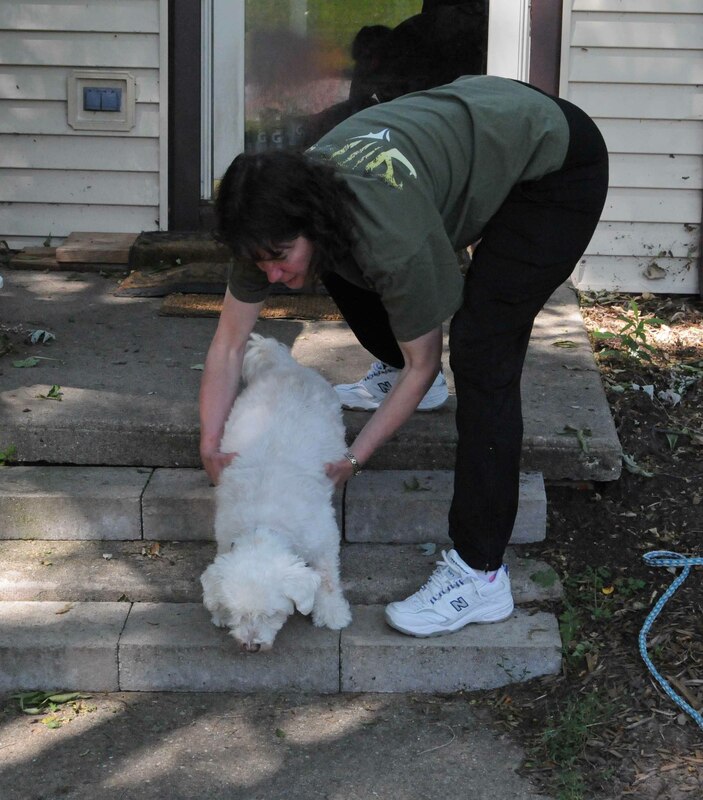 The owner, Erla, was a sweet woman, quite laid-back, and we quickly saw her personality had rubbed off on Lucky, because when she brought Lucky out from the back of this small building, he sprawled out unmoving and looked at us with big brown, very scared eyes. So there we were, hundreds of miles from home, looking at a paralyzed puppy that didn’t seem to have all his wires attached. Fortunately, in the background came the yelping, barking noise of other puppies, so Mark mentioned that perhaps Lucky wasn’t so lucky and perhaps there was another one we could look at? Perhaps Lucky had a brother or sister, I asked? Seconds later, this wiggly, tan and white puppy named Lance was running circles around us. The playful pup we saw after we met Lucky. And then it happened: Lance nudged Lucky, and soon the two were romping around the room, wiggling all over, licking our hands, then running off together . As we watched them play together, Erla mentioned that she’d reduced Lucky’s price because he was four months old. And she said that Lance, who is Lucky’s brother, well, his price was reduced even more because of a scratch on his eye. I looked at Mark, he looked at me and we agreed that because Lucky seemed to need Lance, we couldn’t separate them. So we bought both pups, two collars and leashes, and packed the pups into the car. Over the course of the eight hour drive home, Mark and I agreed we weren’t thrilled with the names given the pups. We contemplated lots of other names as we rolled along, and rejected all of them: Whiney and Drooly, Barfy and UpChuck (as both of the pups got sick on the floor), Shock and Awe, and Sleepy and Dopey. None seemed quite right for our pups. 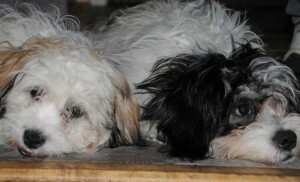 We were home by 5:30 on Tuesday and soon the puppies were adapting to their new home and their strange new owners. 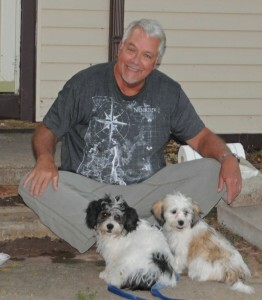 Mark with the two puppies. Both puppies are doing very well. But it’s quite sad they don’t have names we like, so we need your help. Simply respond to this blog posting, and if the name you provide for either pup is selected by Mark and me, I’ll send you an e-copy or signed paperback of Something Furry Underfoot. What could be better than that? Oh, I know, two puppies! Contest ends September 6. Thank you! In my book Something Furry Underfoot are 50 tips, two of which are particularly relevant today. 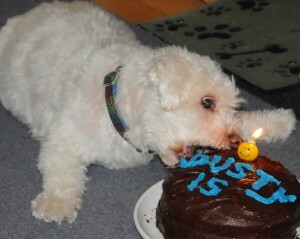 Tip #45: All pets die. Tip #46: It’s always hard when pets die. A little over 15 years ago, Mark came home from a pet store gushing about this little white frou-frou puppy that was scratching madly at the corner of its cage “as if he was trying to get my attention.” A few days later, we went back to get the puppy Mark named Dusty. Dusty on his first day home. Right from the start, Dusty determined that his job was to guard us day in and day out. Every now and then, though, he’d let down his guard and play. And play. And play. He was pals to all the other animals that came into the house: Little Dipper, Purrkins, eight different ferrets, a rabbit, a domestic duck. Dusty didn’t even mind when a hamster ball ran into him. Over the last several months, our 15-year-old pal needed more and more help getting around. Even the special extra steps we put in for him weren’t helpful enough, so we lifted him up and down the steps. Helping Dusty down the front porch. This morning, for the first time ever, Dusty let out a yelp at 5:15 a.m. We got up, helped him outside and after wobbling back in with our help, he plopped back on the floor and just sat there, breathing shallow breaths. I offered him his soft Beneful food and he ignored it. I broke apart pieces of a leftover pork chop and he ate, but slowly. I snuck a pain pill in a piece of pepperoni but I could tell he was not his same old pups self. Then I looked into his eyes and saw this far away look, a look of pain? And I knew. I called the mobile vet; they said they could not arrive until 4 p.m. The rest of the day went slowly. 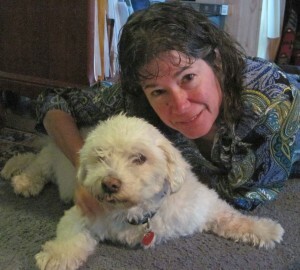 I picked my mom up so she could say good-bye to Dusty, then drove her back home. We let Dusty out and sat with him in the grass for a half hour or so until he decided it was time to go back inside. We helped him back in, put the water bowl in front of him when we thought he was thirsty, and gave him little treats. His breathing stayed shallow and quick and with each passing hour, we knew we’d made the right decision. We took a few more photos, too. My last photo with Dusty. In the afternoon, Dusty decided to go outside one more time. We sat with him the rest of the day as he napped, looked up, napped some more. 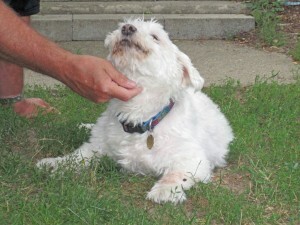 When the vet arrived, we said our good-byes right in the front yard. A few more good itchies. When Mark first brought Dusty home he told me Dusty had wing nubbins where his angel wings had fallen off, and that when he died, he’d grow his angel wings again. This is what Dusty looks like now. It’s also the cover of the book that bears his name. Dusty with his angel wings. 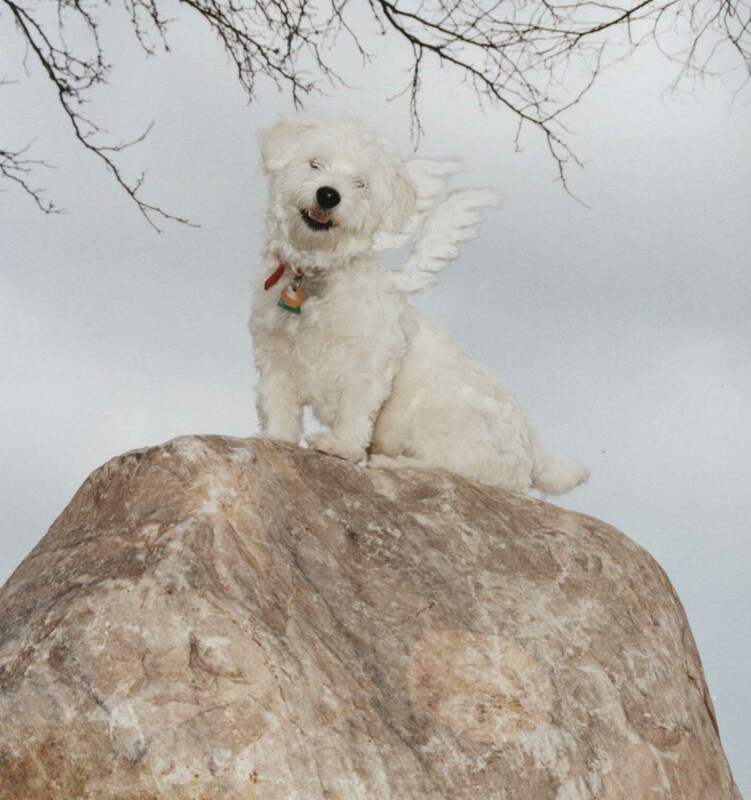 Farewell Dusty, the Angel Pup. Thank you for all you did for us. Little Dipper. Photo by Amy L Peterson. Graphic by Brenda Sayles. 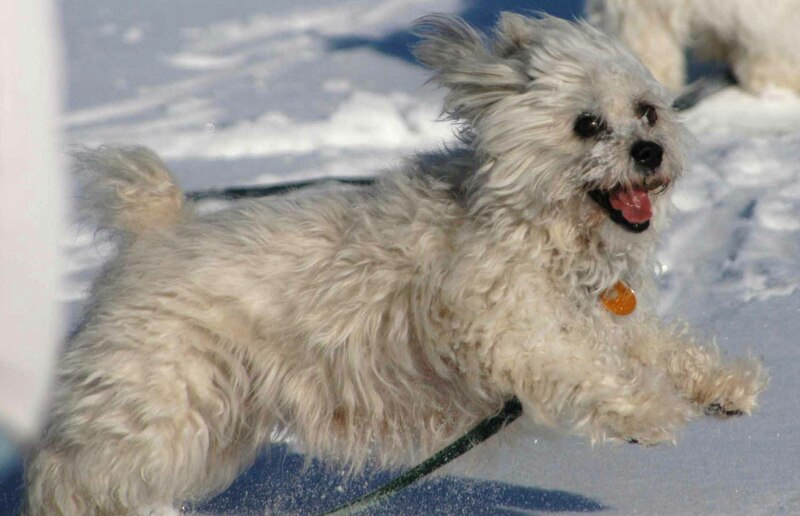 Smaller dogs live longer than bigger dogs. 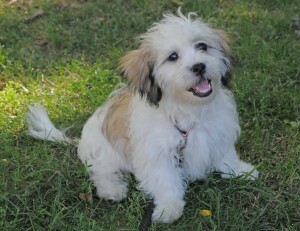 A small dog can live 15-16 years, medium sized dogs 10-13 years, a large dog 7-8 years. Having said that, though, I have a friend whose medium-sized dog lived 18 years, and I know of more than one large dog that lived 14 years. Dogs need quality dog food to eat, fresh water daily, and shelter from the weather. 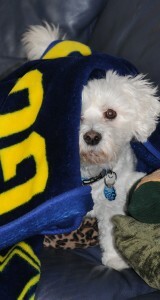 “Shelter from the weather” means keeping your dog inside when it’s real hot or real cold. Click here for vital information on how hot a car can get in the summer time. Dogs can be pricey. I suggested to my 23-year-old stepdaughter that she save up $1,000 before getting a dog. While shelter dogs and rescue dogs are cheaper than full breeds and certain mixed breeds, annual vaccinations for dogs can run $40-200 depending on the shots needed and whether you have access to clinics run by a local shelter. Spaying and neutering your dog to prevent unwanted pregnancies and reduce the number of puppies and dogs in need of good homes can cost $25-$300 depending on whether a local clinic is available to perform surgeries. That’s not so bad if your dog is healthy, but if it isn’t 100% healthy, you may need the rest of that $1,000 right off. Boarding a dog while on vacation can also be costly. Dogs need regular exercise like a daily walk. One reason dogs like to go for walks: new smells. A dog’s sense of smell is at least 1,000 times better than ours. Dogs also need exercise, just like we do. Dogs need owners to be the pack leader. Every dog looks for direction from their owner, and without it, some dogs will take over and get out of control. 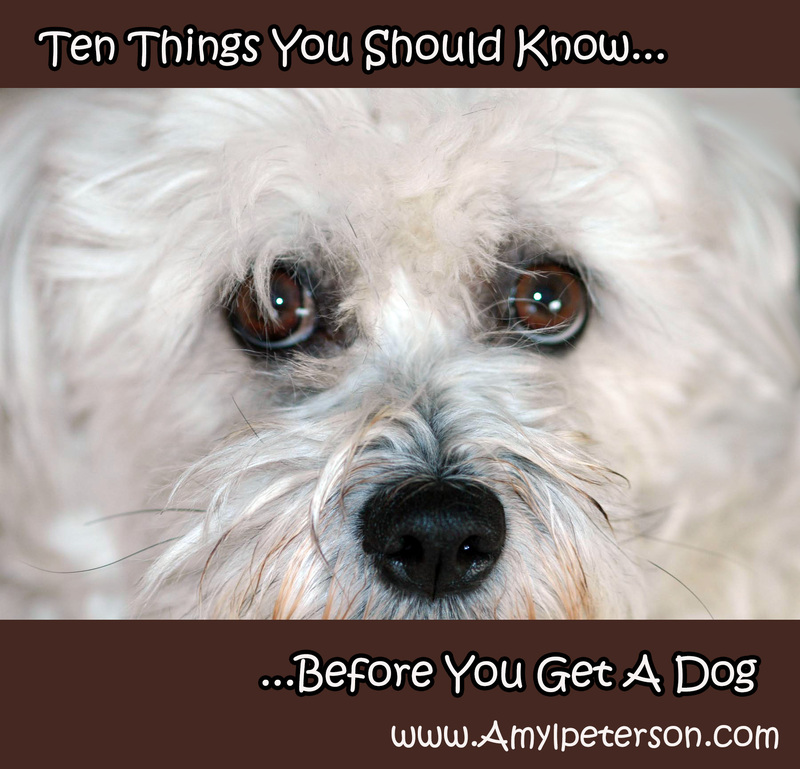 Plan on spending some time–and possibly money–training your dog. Dogs like to have pals. Dogs love to have other pals to play with and hang out with. 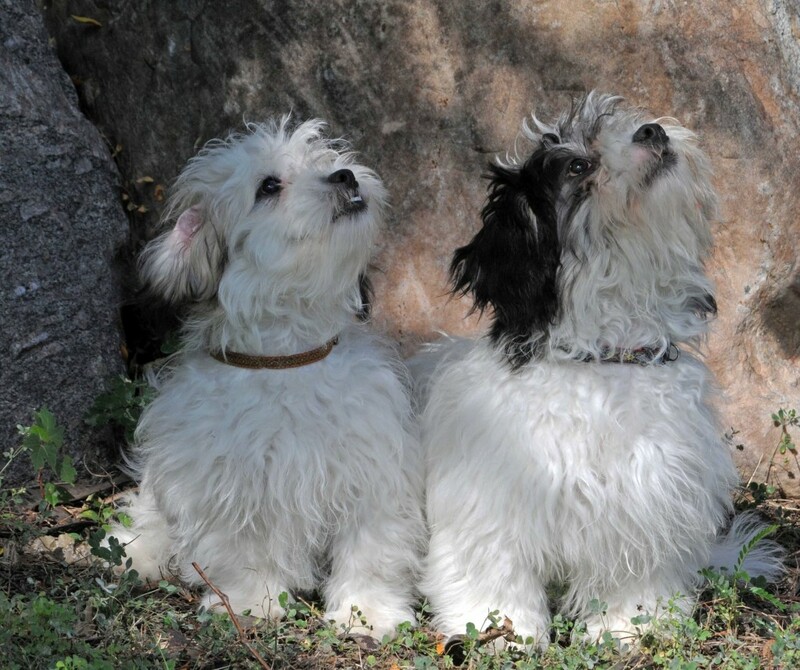 Dusty and Little Dipper, as puppies. 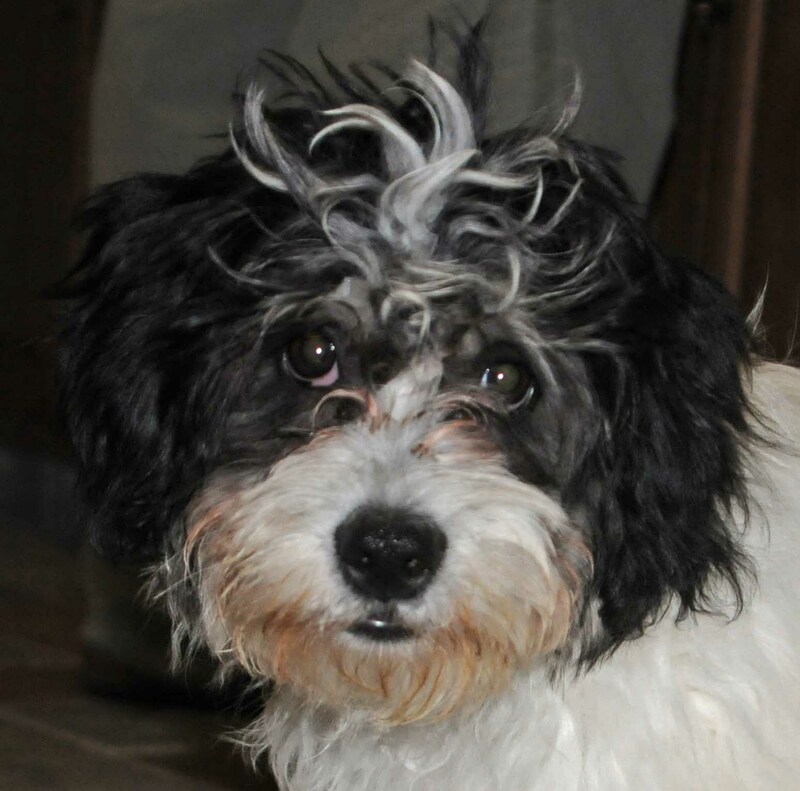 Certain dog breeds need to be groomed regularly. We got Dusty and Little Dipper groomed about four times a year. Sometimes Dusty got a new toy on the way out of the pet store. Dusty with one of his toys. Dogs like to go on vacations. 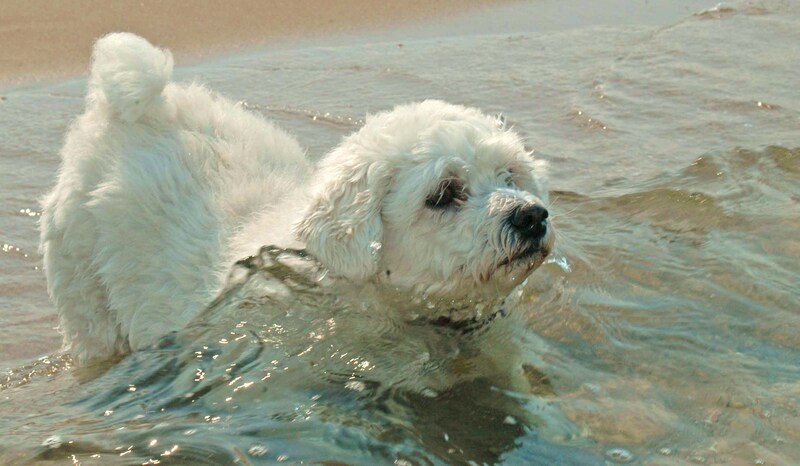 We took our dogs camping and to a Lake Michigan beach where they could run on the sand, swim in the water and roll on dead fish. What could be better? Old dogs require extra care. 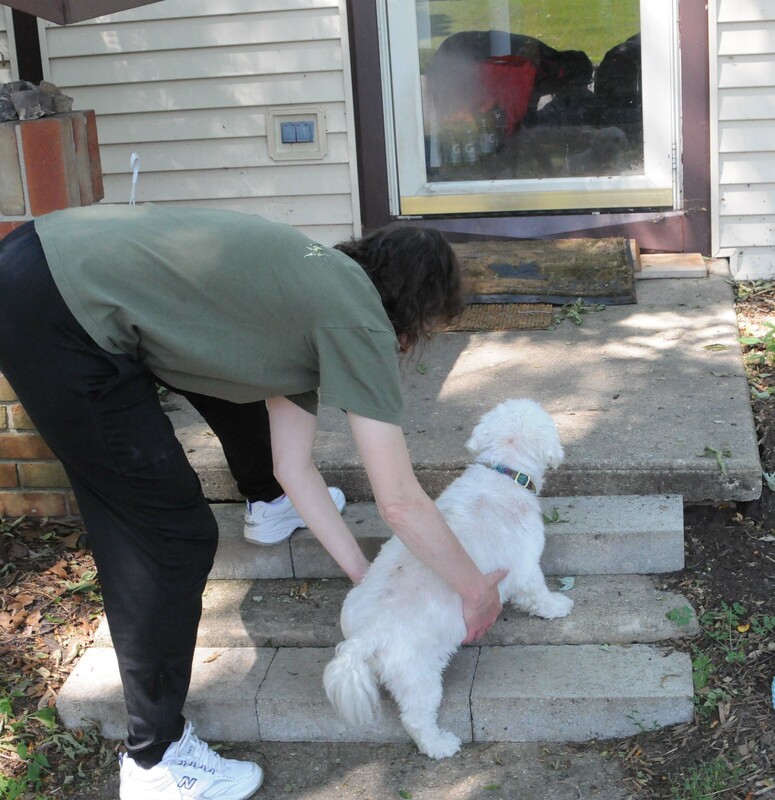 We added extra steps to our front steps for Dusty, and by the time he was 14 1/2, we were lifting him up and down the steps to ease his way. 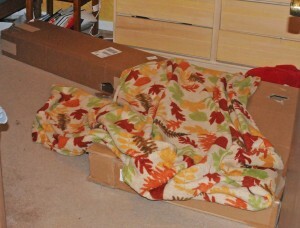 We also lined our house with throw rugs because Dusty tended to “turtle out” onto the floor when his feet slipped out from under him. The house is a bit of a mish-mash of colors, but for Dusty, it’s worth it. Helping Dusty up the steps. 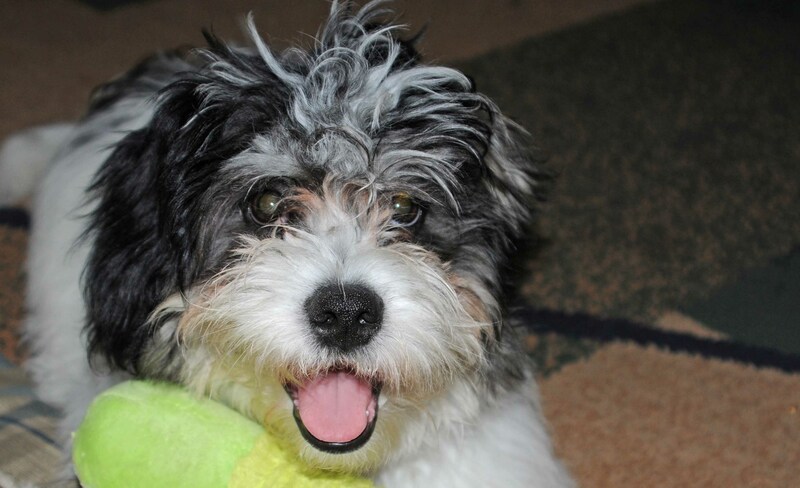 Dogs will respond to your affection and give it out in equal or larger doses. 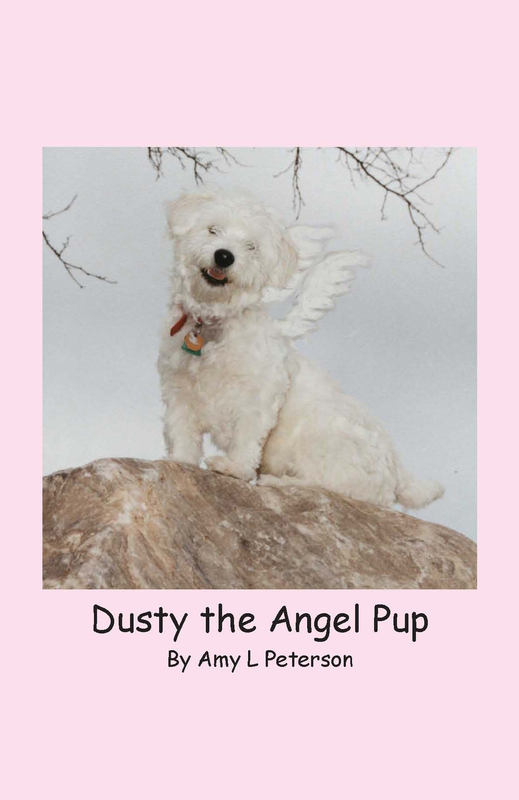 No pet has been as loyal as Dusty, the Angel Pup. None has been more a snuggle-r than Little Dipper. Clearly, Mark was right about getting a dog(s). 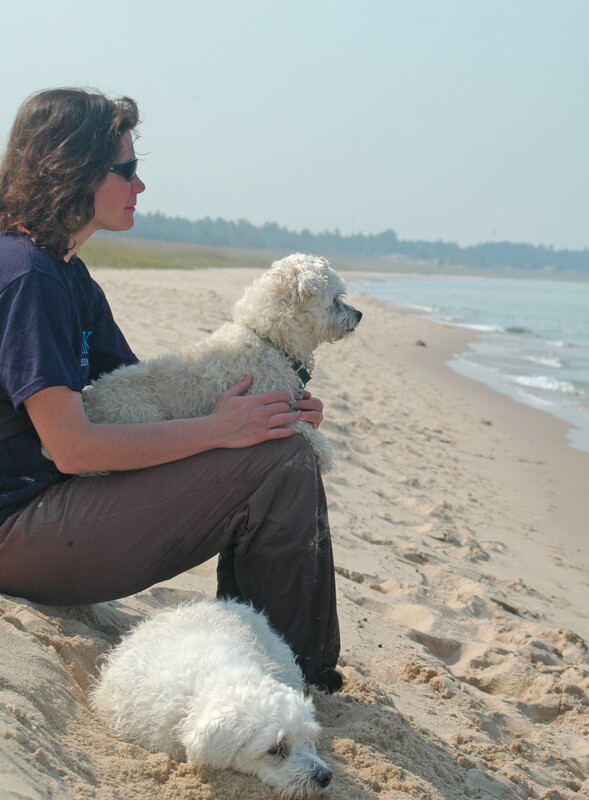 Me and my pups on Lake Michigan. See photos of Dusty, the Angel Pup in his rhyming photo e-book, and read about Dusty and Little Dipper in Something Furry Underfoot, available at Amazon.com and Smashwords.com. 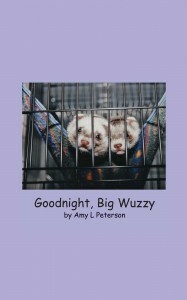 Or go to Amylpeterson.com and click on My Books. 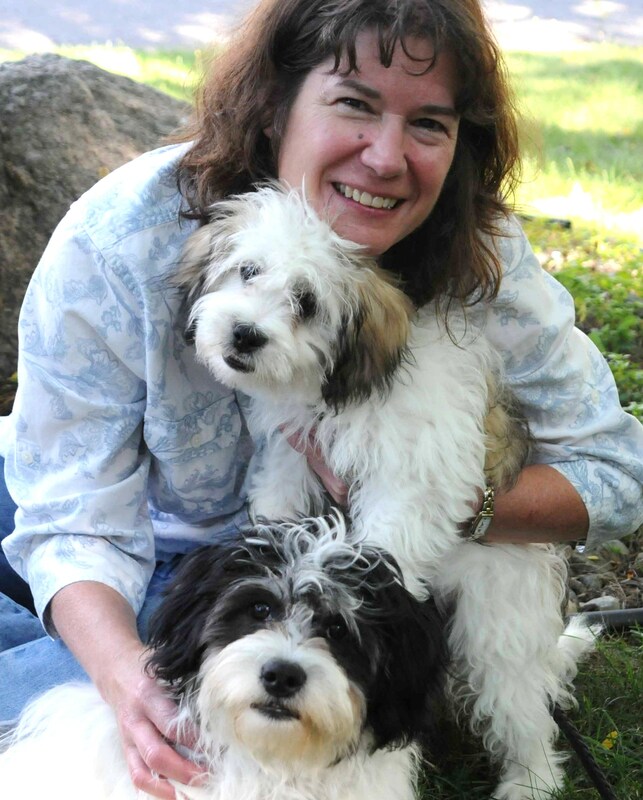 Some proceeds for all my animal books will benefit animal rescue organizations. 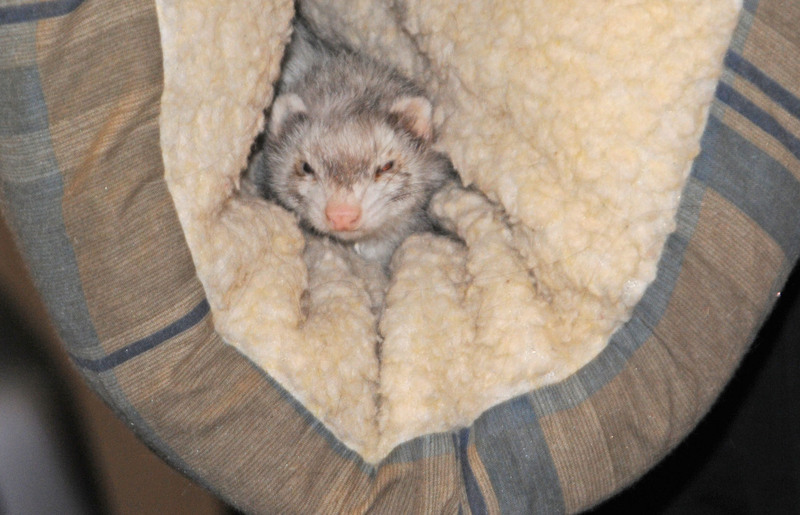 Coming soon to Amazon and Smashwords is my non-fiction book about a whole bunch of critters Mark brought into our house over the course of 18 years. Something Furry Underfoot is my story about taking on frogs, iguanas, hedgehogs, ferrets, hamsters, gerbils, mice, guinea pigs, rabbits, a stray cat, two dogs and a domestic duck. And of course, I knew nothing about any of these critters, except dogs. In Something Furry Underfoot you will learn important things about all of these animals, including the fact that a male hedgehog will go to great lengths to be with a female hedgehog. Dusty the Angel Pups, about a puppy that became our guard dog and pal. Purrkins, the Cat, about a stray cat that makes it clear we still haven’t gotten everything figured out. Bumpkin Gets Big, about a domestic duckling we raised inside our house. Goodnight, Big Wuzzy, about a ferret and his three ferret pals. All three of these easy-to-read e-books are available at Amazon http://tinyurl.com/dy73lfj and at Smashwords.com http://tinyurl.com/cyljsux for 99 cents each. That’s a lot of fur and feathers for less than four dollars. 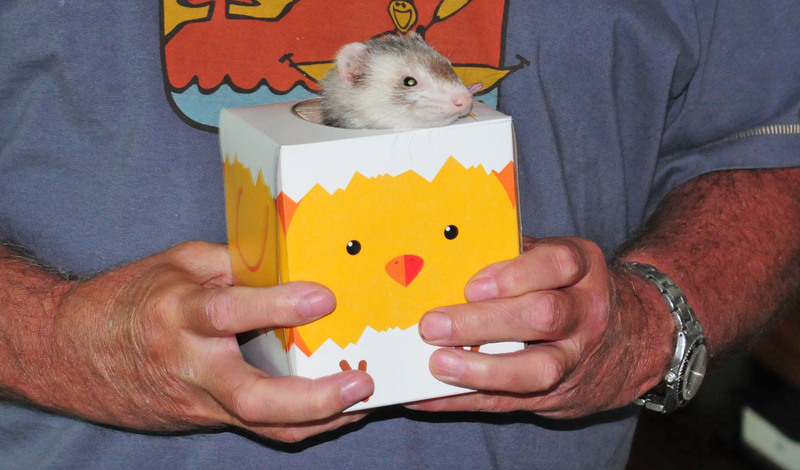 Apparently, I made a couple of people cry with my story about the baby mouse, so I’ve actually been a bit hesitant to report that the Thursday before Easter our last ferret, Chip, passed away. Instead of making everyone sad about her passing, I am instead going to share a bit about her 7-year life. Chip had three other pals to play with for most of her life. Her pals were rambunctious fuzzies that loved to wrestle, hop around and get into anything within their reach. 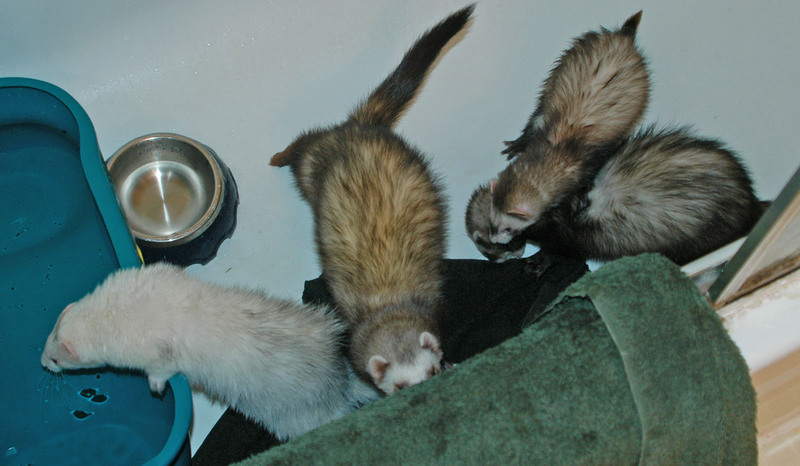 They also loved fresh water, which is why we put a small container of fresh water in our bath tub. Because ferrets like tunnels and holes, we got boxes, cut holes in various places, and threw a blanket on top. 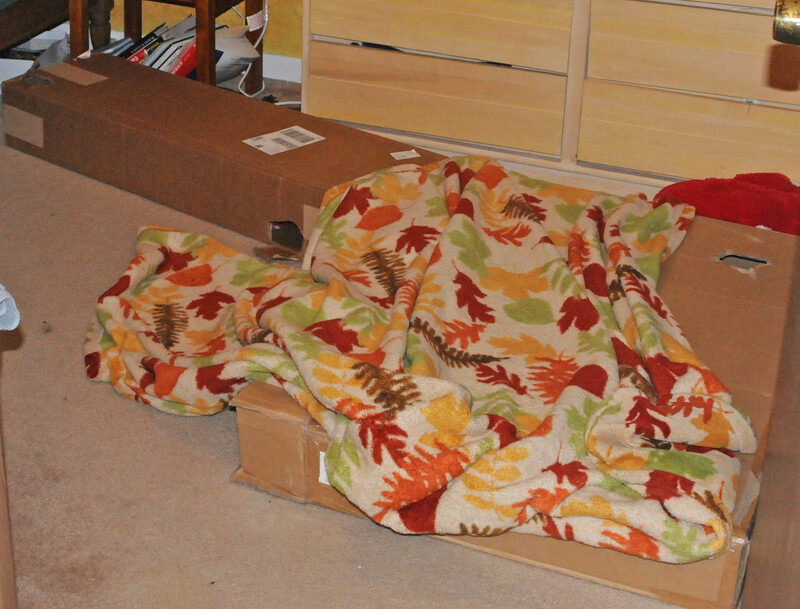 Ferrets love boxes with holes; also, blankets. 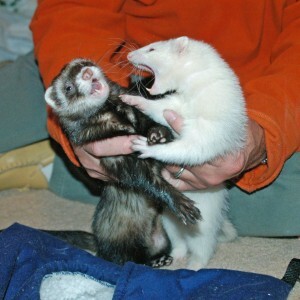 The ferrets got out to play for an hour or so each day. It was like having a bunch of two-year-olds to supervise. 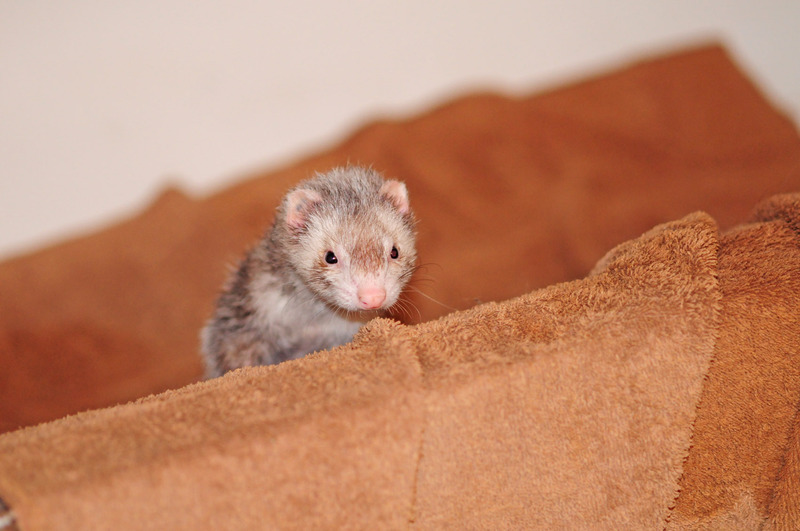 Anything on the floor or within climbing reach was worth checking out–house plants, cupboards, clothes, anything. Chip in the sleeve of my rain coat. 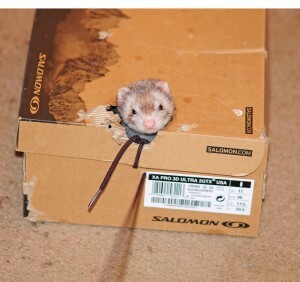 Even an empty box is of interest to a ferret. Chip inside a small tissue box. Sadly, Hoppie, Smiggles and Peanut only lived about five years. 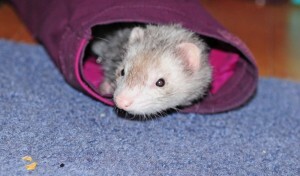 That left Chip without any ferrets to play with for the last two years of her life. Mark and I became her play pals. We rearranged old boxes, found new boxes, and played with her. We also made sure she continued to have access to fresh water in the tub. She also got to take over the spare bedroom. Chip in the bathtub, 2012. 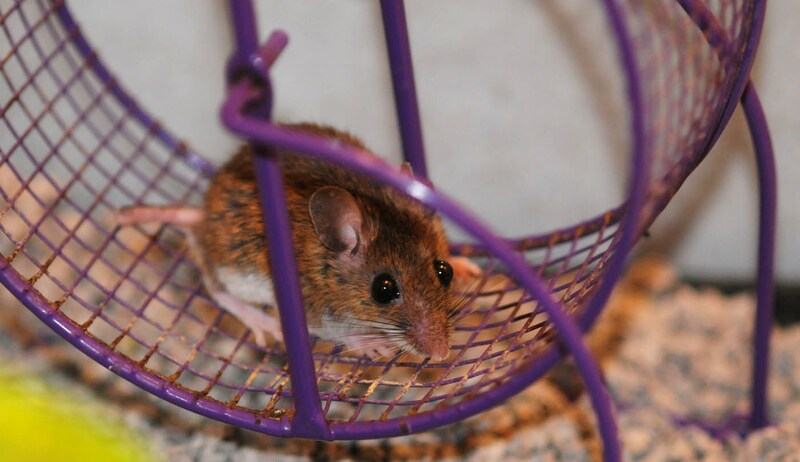 As Chip got older I discovered two modes of transportation so she could cover more ground inside the house. 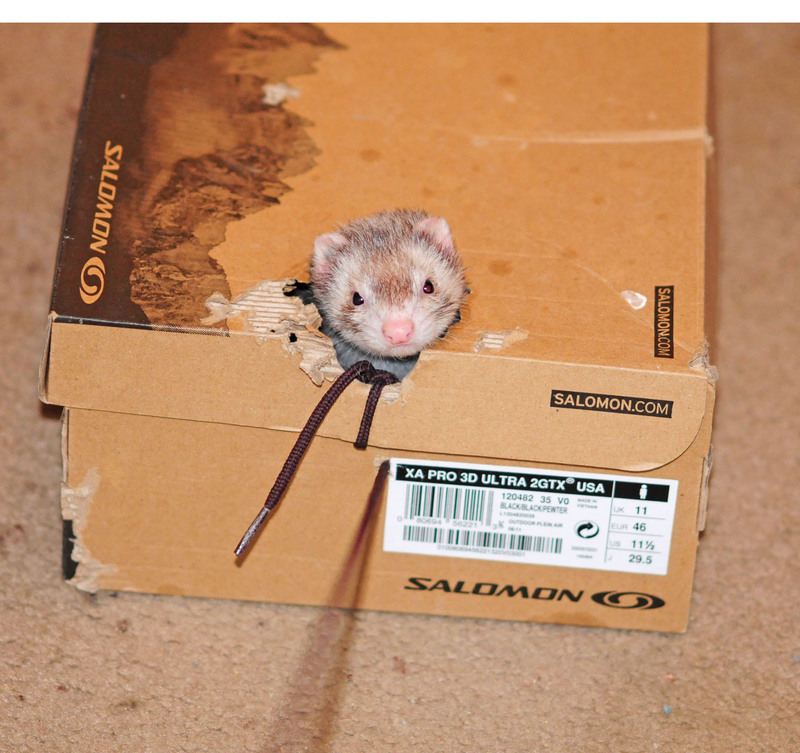 Chip in a shoebox I pulled around the house. During her last months, she found a ride in the dogs’ folded bed cushion even more comfy. Chip in the dog-bed hovercraft I held inches above the floor as I walked around the house. 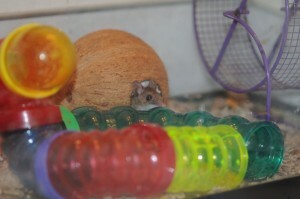 On the weekends, I let her spend the entire day outside her cage, in her bedroom and in the bathroom. 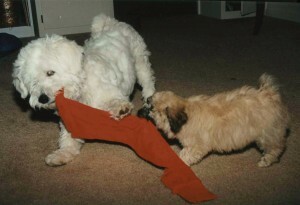 We’d play for a while, and when she was tired, she made a nest out of our clothes. To get her access to new smells and sights, I carried her more and more in the box and dog bed, stopping in front of plants, in front of Dusty or Purrkins, stopping by anything that was new or might smell different. Chip in one of Mark’s soft pull-overs. When chewing became difficult, I soaked her food in water. When she got too weak to get into the bath tub I put the water dish where she could walk to it. Every day, I gave her a little rub-down. Most days I carried her around the house so her world was not confined to a single room. Chip died in her sleep snuggled up in one of my old sweatshirts. It was a pleasant a passing as I could hope for. While Mark and I had 8 ferrets over the years that were all lots of fun, and all unique, there are other small, bouncy fuzzies that we haven’t opened our house up to, like chinchillas. Mark would like to try more rabbits. Time will tell what bouncing fuzzy enters our lives next. 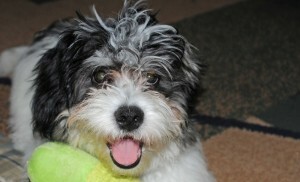 For now I can only think that it will be hard to beat a fuzzy like my pal Chip.